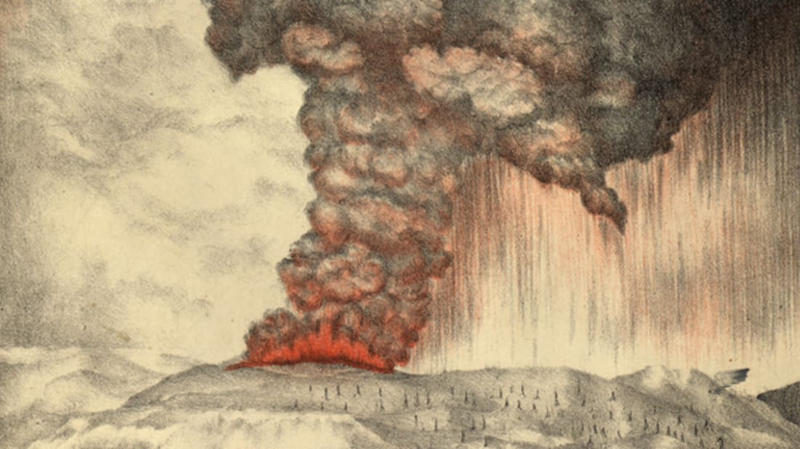 On August 27, 1883, Krakatoa (alternately called Krakatau), an uninhabited volcanic island near Indonesia, erupted spectacularly, expelling huge clouds of gas and ash, generating massive tsunamis, and killing more than 36,000 people. Here are a few things you might not have known about one of the most powerful and devastating eruptions in modern history, which had effects worldwide. 1. SIGNS OF THE ERUPTION TO COME BEGAN IN MAY. Krakatoa had been dormant for around 200 years when it woke up on May 20, 1883. A cloud of ash, reported by the captain of a German warship, rose nearly 7 miles above the island. According to an 1884 article in The Atlantic, while no one in Anjer, 25 miles from the island, or Merak, 35 miles away, reported anything unusual that day, the inhabitants of Batvia, 80 miles away, “were startled by a dull booming noise, followed by a violent rattling of doors and windows. Whether this proceeded from the air or from below was a matter of doubt, for unlike most earthquake shocks the quivering was only vertical.” There were rumblings and blasts from the volcano’s vents for the next three months. 2. THE ERUPTION STARTED ON AUGUST 26. But the most terrifying part of the disaster wouldn’t occur until the next day. 3. ONE ERUPTION ON AUGUST 27 WAS HEARD 2800 MILES AWAY. Starting at 5:30 a.m. on August 27, Krakatoa experienced four massive explosions over the course of 4.5 hours. The blasts were so loud they could be heard as far away as Sri Lanka and Perth, Australia—3000 miles away. The force of the final blast at 10:02 a.m. was 10,000 times more powerful than the one unleashed by the atom bomb dropped on Hiroshima, and shockwaves generated by the eruption registered all over the world. "[A]ll of a sudden there came a great noise. We … saw a great black thing, a long way off, coming towards us. It was very high and very strong, and we soon saw that it was water. Trees and houses were washed away … The people began to ... run for their lives. Not far off was some steep sloping ground. We all ran towards it and tried to climb up out of the way of the water. The wave was too quick for most of them, and many were drowned almost at my side ... There was a general rush to climb up in one particular place. This caused a great block ... A great struggle took place for a few moments, but ... one after another, they were washed down and carried far away by the rushing waters. You can see the marks on the hill side where the fight for life took place. Some ... dragged others down with them. They would not let go their hold, nor could those above them release themselves from this death-grip." "With incredible presence-of-mind he decided the only way to save himself was to leap aboard the crocodile and try to ride to safety on its back. How he did it is anyone's guess, but he insists he leapt on, dug his thumbs into the creature's eye-sockets to keep himself stable, and surfed on it for 3km. He held on until the wave broke on a distant hill, depositing him and a presumably very irritated croc on the jungle floor. He ran, survived, and wrote about the story." Most of the 36,417 people who died—90 percent—were killed by tsunamis. The remaining 10 percent fell victim to falling debris called tephra and pyroclastic flows, hot, fast moving masses of volcanic gas and ash. 5. … AND RELEASED 11 CUBIC MILES OF ASH INTO THE ATMOSPHERE. The sun in the area was blacked out for three days, and the cloud of ash spread 275 miles. “The matter expelled,” wrote The Atlantic, “rose to an elevation so tremendous that, on spreading itself out, it covered the whole western end of Java and the south of Sumatra for hundreds of square miles with a pall of impenetrable darkness.” There was so much ash that in Nicaragua, on the other side of the Pacific, the sun was blue. After the eruption, floating pumice fields—nearly 10 feet deep in places—clogged ports, interrupting trade. 6. WHEN THE ERUPTION WAS OVER, MOST OF THE ISLAND WAS GONE. Pre-eruption, the island was 2625 feet high and 3 by 5.5-miles, with three vents. But the last eruption—which had an estimated force of 200 megatons of TNT—blew the island apart. Only one-third of the island survived. 8. … WHICH MAY BE WHY THE BACKGROUND OF THE SCREAM IS SO VIBRANT. In 2003, researchers announced in Sky and Telescope that they had found not only the exact location in Oslo, Norway, where Munch placed the figure in his famous 1893 painting, but that they had determined that particles in the air from Krakatoa’s eruption were responsible for the painting’s blood-red sky. “It was very satisfying to stand in the exact spot where an artist had his experience," paper author Donald Olson, a physics and astronomy professor at Texas State University, said in a press release. “The real importance of finding the location, though, was to determine the direction of view in the painting. We could see that Munch was looking to the south-west—exactly where the Krakatoa twilights appeared in the winter of 1883-84.” The scientists said that newspaper articles published after the eruption reported the red skies. 9. THE ERUPTION AFFECTED EARTH’S TEMPERATURE FOR YEARS AFTERWARD. The volcanic debris in the atmosphere was so great that it filtered the amount of sunlight reaching Earth’s surface, causing global temperatures to fall 1.2 degrees Celsius the next year. Temperatures were finally normal again in 1888. 10. THERE’S A NEW VOLCANO THERE TODAY. In December 1927, fishermen discovered that a new volcano had emerged from the caldera of the former Krakatoa. It was named Anak Krakatau (Child of Krakatau), and it’s still active today. You can see it in action in the video above.